The Asianera brand is internationally known for its distinctive “East meets West” design style. Our constantly evolving porcelain designs are unique interpretations of influences from different cultures and from nature. We specialize in fine hand-painting which gives our designs its distinctive artistry and elegance. Our products are found in the finest luxury hotels and restaurants and retailers around the world. We also partner with some of the most luxurious and cutting-edge design hotels and restaurants to custom-design both patterns and shapes for projects. 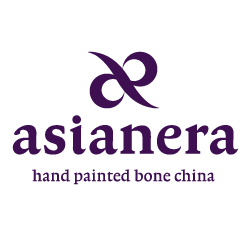 Asianera started with the belief that distinctive fine quality china could be designed and produced in China, the place which originally invented and defined porcelain beauty centuries ago. Rather than emulating traditional designs, we set our minds to developing a unique design style and product line which reflect an Asian vernacular within a contemporary context. Fate brought founders Grace Liu and Jian Ping (JP) Li together in the Northern industrial city of Tangshan, China. It was 1995, and they felt this was the beginning of a new exciting Asianera. A passion for ceramics and a desire to design and create things of beauty drove American-born Chinese Grace Liu to embark on a journey of a lifetime. Asianera became a reflection of her, an intermingling of two cultures. Born and raised in upstate New York, like many children of immigrant parents, she was instilled with a strong sense of heritage. After graduating from University of Michigan, her first career was with IBM’s Sales and Marketing Division in New York City and Hong Kong. Years later she discovered she had enough of corporate life and was ready for an entrepreneurial challenge. JP, a native of Tangshan, is an award-winning artist and designer who lives and breathes ceramics. He started his career on the product design team with China’s leading bone china factory in the 80s, the Tangshan Number One Bone China Factory. Later he attended the prestigious Central Academy for Arts and Crafts in Beijing which provided fertile ground for his natural talents to blossom and receive award-winning recognition. Recently, he was awarded the coveted title of Master of Ceramic Art & Design by the Chinese National Ceramics Association. Grace and JP established Asianera on a foundation of mutually held values which extends beyond the product to positively influence the company’s employees, clients, and community. Their mission continues to grow and develop. Fine hand-painting on bone china is the Asianera medium. Our passion is for the artistry of hand-painting and the magic of the ceramic body. We chose fine bone china for its elegance, durability and ability to carry a broad range of colors from rich, bright shades to earthy muted shades. Designing and producing for functionality is our profession. The result --- fine hand-painting combined with the finest quality bone china to form elegant functional art for everyday living. Asianera’s unique style derives in great part from its roots in the traditional Chinese painting style called gongbi. Gongbi is characterized by highly detailed brushstrokes with subject matter which is frequently realistic or narrative rather than interpretive or abstract. Asianera employs this centuries-old hand painting technique on fine bone china. Though each brushstroke is very precise, each piece is unique and different from each other. Over the years, Asianera has also incorporated other painting styles like abstract ink wash and watercolor. Our designers follow worldwide developments in interior design closely. That inspiration is translated into our designs, which are then realised by experienced craftsmen. This means you always get the best of both worlds. Another unique attribute of Asianera’s style are their many distinctive shapes which are deeply informed by traditional Chinese culture, philosophy, art, architecture, and history. Yet as much as Asianera’s style is steeped in Chinese tradition, it is most certainly not traditional. It is equally intermingled with a contemporary design sense in context, in functionality, and sometimes even in a playful sensibility. Recently, Asianera has also launched two new sub-brands: Lian and AE2. The Lian brand is our cooperative designers’ brand. These are the creative works of invited international designers working side-by-side with our own designers and artists. The results are cutting-edge and decidedly contemporary. AE2 is our entry-level bone china brand which focuses on dinnerware and tabletop accessories for young professionals and young families just starting to appreciate the joys of collecting and using fine china, and the fun of home entertaining. All our products strictly adhere to world-wide export safety standards.